The largest population of Asian elephants remaining in the wild is in danger and an Australian organisation, the Rainforest Information Centre, is spearheading the campaign to persuade Indian governments to reconsider their decisions to situate developments where elephant habitat will be disrupted. If you read no further than this, please go to http://bit.ly/india_elephants where you can voice your stand on this issue. Elephants once ranged throughout most of Asia, but their habitat is today reduced to isolated fragments. 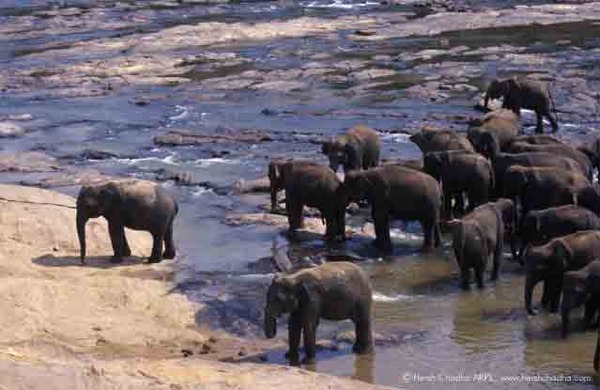 The largest remaining population of wild Asian elephants inhabits the Nilgiris biosphere reserve. There are more elephants in the Nilgiris alone than in any other country in Asia. 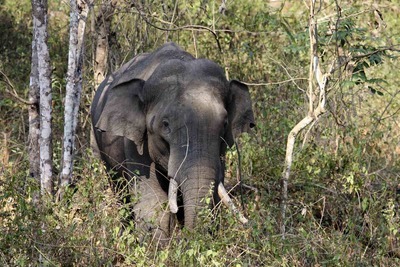 Of 2000 elephants surviving in Peninsular India in various fragmented habitat islands, the largest single population, somewhat more than 1000 elephants, survive in a near contiguous habitat extending over this tract. Daily quest for food and water in Nilgiris biosphere. Pix by Hersh Chadha. They range through the three south Indian states of Tamil Nadu, Kerala and Karnataka following a seasonal food supply along well-trodden paths that they have travelled since time immemorial. However, some of these corridors are being disrupted by human encroachment threatening the very survival of these ancient pathways, and their traditional travellers. There are two main threats to the wellbeing and survival of this particular elephant population, one in Kerala and the other in Tamil Nadu. Encroachment on ancient pathways. Pix by K.V.Uthaman. Due to habitat fragmentation, elephants moving from Karnataka to Kerala have to pass through a corridor which is only about 2.5 km wide. A major inter-state highway passes through this narrow corridor. It is used by hundreds of vehicles round the clock. There are also four different government departmental check-posts located on the Kerala side outside the forest. Recently a decision was made to relocate them to the centre of this narrow corridor. The checkpoint clearance takes hours, so this would mean hundreds of lorries parked along the road throughout the night on either side of the checkpoints, effectively cutting off this vital lifeline. A better solution would be the relocation of the checking stations to outside the forest on the Kerala side of the corridor where suitable land for this is available. The second threat to these same elephants lies in Tamil Nadu, in the eastern part of their range, where the best wet season forage is found. Here a vast physics experiment is planned, the USD167 million India-based Neutrino Observatory (INO). During the summer, as food and water becomes scarce, elephants need to migrate from Tamil Nadu to the evergreen forests of Kerala. To do so they must pass through a corridor at Singara, right where the INO is to be located. The proposal would tunnel more than two kilometers and build a 100,000 ton neutrino detector underground. Drilling and construction would require over 150,000 truckloads of material to pass through 35 kilometers of forest - and two tiger reserves. Forests are homes to these gentle beasts. Pix by Priya Davidar. This project has not been carefully thought through. There has been no systematic attempt to determine the best site. There are plenty of options: the INO is not site specific and could be built anywhere with one kilometer of rock cover. In 1964, Indian scientists were the first in the world to detect neutrinos created in the atmosphere. The facility where this was accomplished was shattered in 1992 when Kolar Gold Fields closed. Reopening the existing tunnels at Kolar will be cheaper than digging new ones and far less destructive of the environment. 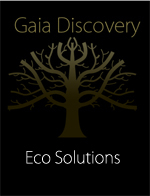 None of this has been properly taken into account when selecting the site. Indeed, they could hardly have picked a site in India more likely to damage wildlife. As well as being home to the largest single population of Asian elephants in the world the Nilgiris is also one of the most important tiger habitats in the country. Living around the proposed site for these projects are 676 species of plants, 173 species of vertebrates, 12 species of amphibians, 38 species of fish, 46 species of reptile, 87 species of birds and 28 species of mammals (including tiger, leopard, gaur, wild dog, bear, deer and elephant). The conservation of this critical elephant habitat would not only serve to protect the largest Asian elephant population, but would also benefit the entire ecosystem, including other rare species. Which is why the Nilgiris was declared as a UNESCO Bio-sphere reserve in the first place. Please go to http://bit.ly/india_elephants where in less than a minute you can send emails to over 20 officials in the two states who could, if they wished, protect these elephants.